TWENTY-SEVEN children were involved in an adoption that broke down in Northern Ireland and another 16 children were involved in planned adoptions that failed over a four-year period, according to new figures compiled by the Health and Social Care Board (HSCB). The HSCB stressed that the number of adoption failures from 2014/15 to 2017/18 was small compared to overall success rates, but adoption support groups have said there is an urgent need for more support for families. The Detail has obtained the findings of an analysis carried out by the HSCB, which reveals a rising trend in the number of adoptions and planned adoptions that broke down in Northern Ireland. Over the four-year period, 16 planned adoptions broke down before the process was completed; 27 placements broke down after a child's adoption was legalised, some many years into the placement. The breakdowns included individual placements and children placed as sibling groups. Planned adoptions that broke down before the process was formally completed had lasted from nine days to 10 months. The children involved ranged in age from less than one to nine-years-old. Adoptions that broke down after the process was legalised had lasted between five and 17 years. These children were predominantly in their teens. Difficulty managing the behaviour of children was among the most common reasons why adoptions broke down after they were legalised. The reasons were solely from the perspective of social services and the analysis noted the families involved may have an entirely different perception. Other reasons why adoptions and planned adoptions broke down included relationship difficulties for parents and between parents and children, concerns in relation to care given, and contact with the birth family. The board also identified gaps in current supports and services, including the lack of a regionally agreed adoption support pathway, a “postcode lottery” for available supports, and challenges accessing psychological services. The HSCB confirmed that 12 previously adopted children came into the care system in 2017/18, representing a recent rise in adoption disruptions. A spokesperson for the board said: "There has been a slight increase in adoption disruptions. This must be seen in the context of the number of adopted children in Northern Ireland. "In excess of 1,500 children have been adopted in Northern Ireland in the last 18 years and therefore the number of disruptions remains very low. The figures come as The Detail also spoke to one couple, Michael and Lisa, about their experience of a planned adoption that broke down in less than two months and followed repeated requests for support for one of the children. The couple received an apology from Belfast Trust for not receiving adequate support when two young children were placed with them for adoption last year. See here for Michael and Lisa’s full story. Voluntary groups and charities working with adoptive families say the HSCB findings highlight the need for greater support. Adoption UK, a charity that supports adopters in Northern Ireland, said it deals with around 30 families in crisis every year. Meanwhile new legislation is being drafted to modernise Northern Ireland’s adoption practices and strengthen existing supports for families and children. The draft Adoption and Children Bill went out for public consultation in January 2017 just before the collapse of Stormont. In the current political vacuum, it remains unclear when the legislation could be introduced. The Department of Health confirmed work is ongoing to finalise the legislation “by late Spring 2019”. The Department also confirmed additional one-off funding of £425,000 this year for investment in post-adoption support across all trusts. It takes three years and two months, on average, for a child to be adopted in Northern Ireland, from their last entry into care to the completion of the adoption process. For adoptive parents it can take anywhere from two to four and half years to complete an adoption depending on whether the prospective parents are applying as foster carers, dual carers, or are already caring for the child concerned. Most children waiting to be adopted live with future adoptive parents on a fostering basis until legal proceedings are finalised. This can take on average seven to eight months. The HSCB said the number of adoptions in Northern Ireland averages between 85 and 90 every year. The number of children adopted from care, however, can vary from year to year and across health trust areas, as the following chart illustrates. 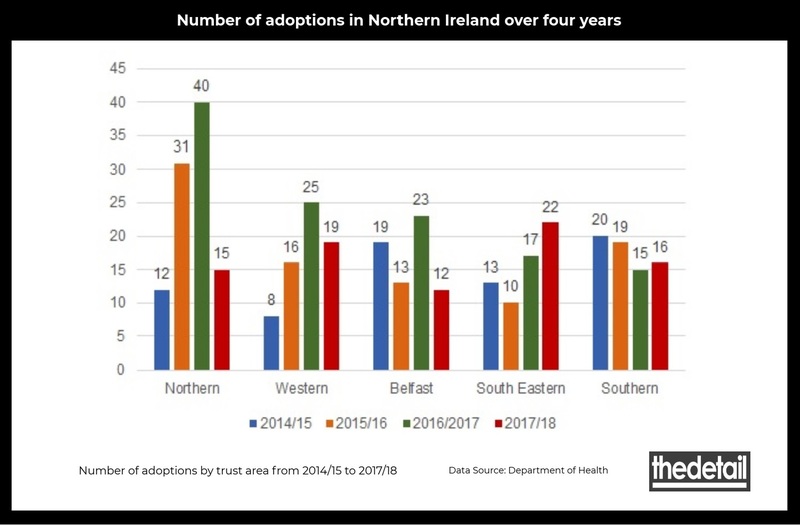 As of November 2018, 24 children were waiting to be placed with adopters across Northern Ireland, according to the HSCB. Adoptions can break down for a variety of reasons and at any stage of the process. A planned adoption can break down before the process is complete and the legal paperwork is signed off and a completed adoption can breakdown several years later when the legally adopted child is older. The HSCB differentiates between completed adoptions and planned adoptions that break down. A completed adoption that breaks down and sees a previously adopted child, up to the age of 18, coming into the care system is defined by the HSCB as an adoption "disruption". 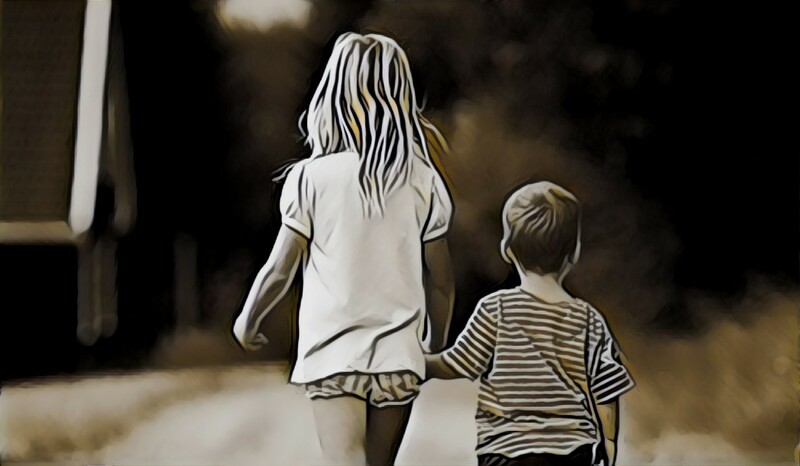 Planned adoptions - where children are fostered by a family with a view to adoption but the process has not been completed - can also break down and end prematurely. The HSCB, however, does not classify this type of breakdown as a "disruption" because the children involved are still within the care system. 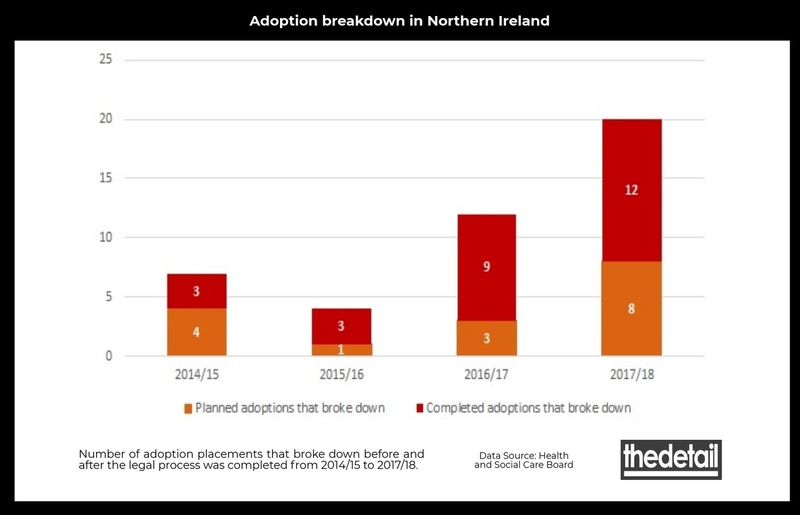 Data on adoption and planned adoption breakdowns in Northern Ireland is not routinely published by health and social care trusts, the HSCB, or the Department of Health. In the absence of officially published data, The Detail requested and received information on the number of breakdowns and disruptions from each trust under Freedom of Information (FOI) legislation. We also sought figures from the HSCB but it declined to share the findings of a recent scoping exercise looking at the breakdown and disruption of adoptions and planned adoptions. The Detail, however, has since obtained these unpublished HSCB findings and it is these figures we are reporting on today. A spokesperson for the HSCB said: “Unfortunately for all involved, adoptive placements can break down. Many adopted children have experienced abuse and neglect and this trauma can have an impact on their ability to make attachments and to regulate their emotions. Many adopted children will make significant progress in their adoptive families but for a very small number persistent issues and challenging behaviours can lead to placement breakdown." When difficulties or challenges do arise adoption families frequently look to support services, such as Adoption UK. The charity organisation offers support to families at all stages of the adoption process and is funded through the HSCB. Ms Havlin continued: “We see around 30 families every year across Northern Ireland who are in crisis. We have an advocacy worker who supports families facing issues that could relate to the behaviour of a child, education, or contact with birth parents and where an adoption placement is at risk of breaking down. The adoption process is complex and brings with it many challenges. Sheila Lavery, who is leading a pilot project in post-adoption support in Northern Ireland, said trauma is among the greatest challenges. Ms Lavery, project co-ordinator of the Therapeutic, Education and Support Services in Adoption (TESSA) project, said: “Adopted children are often seen as the ‘lucky ones’ who get a forever home through adoption; people fail to recognise the journey to adoption is a traumatic one that leaves adopted children among the most vulnerable in society, and the trauma doesn’t necessarily go away when you get adopted. The five-year pilot initiative offers post-adoption support to families with children between the age of 2-12 years. Supports can range from equine, art, and music therapy to counselling for parents, as well as awareness and training programmes for schools. Meanwhile the Department of Health has allocated £425,000 in one-off funding across all trusts this year to invest in post-adoption support. The Department of Health confirmed the 2018/19 transformation funding would be used to recruit additional staff to establish specialist post-adoption support teams in each trust area. A spokesperson said: “These teams once in place will assist children and their carers to understand and manage the consequent challenges of early and unresolved trauma, with a view to reducing placement disruption and to maximise outcomes for children." The HSCB said the investment would “ensure that adoptive families get more support including therapeutic work where this is appropriate”. These therapeutic supports include Theraplay and specialist therapies to treat emotional and behavioural difficulties. Click here to read about one couple’s experience of what happened when a planned adoption, involving two young boys, broke down. If you are interested in adoption you can enquire about adopting a child or children in Northern Ireland by calling 0800 0720 137 and asking for an information pack.